When trees are close to overhead power lines, public safety and the uninterrupted supply of electricity can be compromised. While respecting the contribution that trees make to our quality of life, Hydro Ottawa trims more than 60,000 trees per year as part of a regular maintenance program. 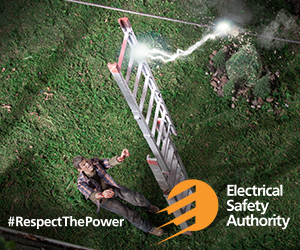 Tree contact with overhead power lines can cause fires, equipment damage or cause power outages. Keeping a close eye on tree and vegetation growth is everyone’s responsibility. Our forestry inspectors monitor and gather data about trees in proximity to overhead power lines on a regular basis. They will trim trees that are directly in contact with a power line, or within 3 meters of a power line. However, it is your responsibility to monitor the service wire that feeds electricity directly to your home, and trim the vegetation around it. In such cases, we can arrange a temporary planned outage on your property to create a safe work environment for you or a licensed contractor. If you notice a tree near an overhead power line, or you need a temporary outage to trim or remove trees on your property, submit a non-electrical service request online or contact our Forestry Team at 613-738-6400 option 4. They are available weekdays between 8 am and 5 pm (excluding statutory holidays). To learn more about the trimming program and practices, read our Frequently Asked Questions and our Tree Planting Advice brochure. If you have further questions, contact us for assistance. Learn about how we handle tree trimming.